Ex 3.1, 2 (Street Plan): A city has two main roads which cross each other at the centre of the city. These two roads are along the North-South direction and East-West direction. All the other streets of the city run parallel to these roads and are 200 m apart. There are about 5 streets in each direction. Using 1 cm = 100 m, draw a model of the city on your notebook Represent the roads/streets by single lines. There are many cross-streets in your model. A particular cross-street is made by two streets, one running in the North-South direction and another in the East-West direction. 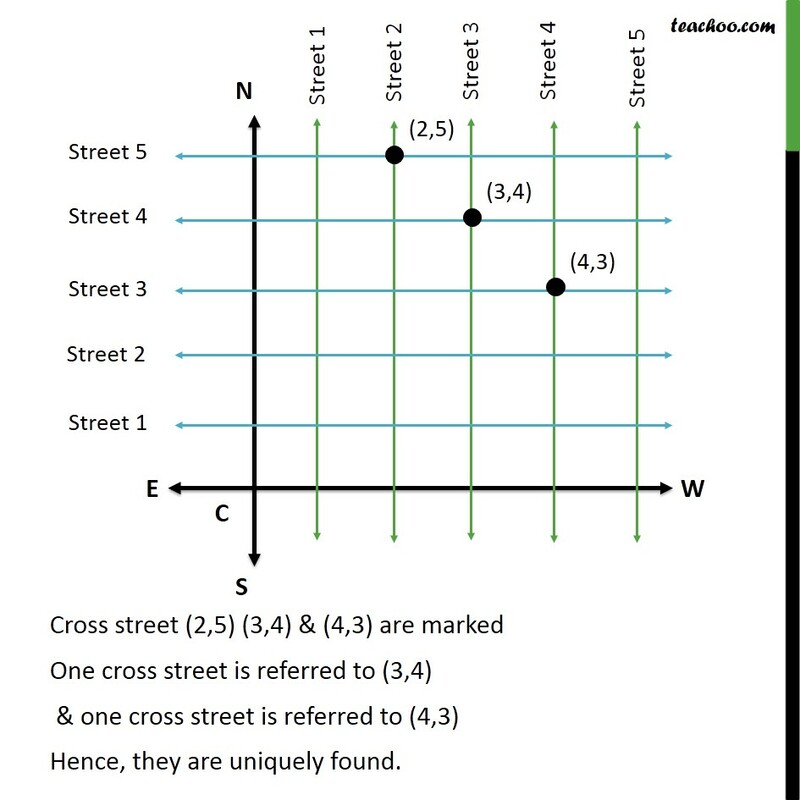 Each cross street is referred to in the following manner: If the 2nd street running in the North-South direction and 5th in the East-West direction meet at some crossing, then we will call this cross-street (2, 5). Using this convention, find: (i) How many cross - streets can be referred to as (4, 3). (ii) How many cross - streets can be referred to as (3, 4). Cross street (2,5) (3,4) & (4,3) are marked One cross street is referred to (3,4) & one cross street is referred to (4,3) Hence, they are uniquely found.